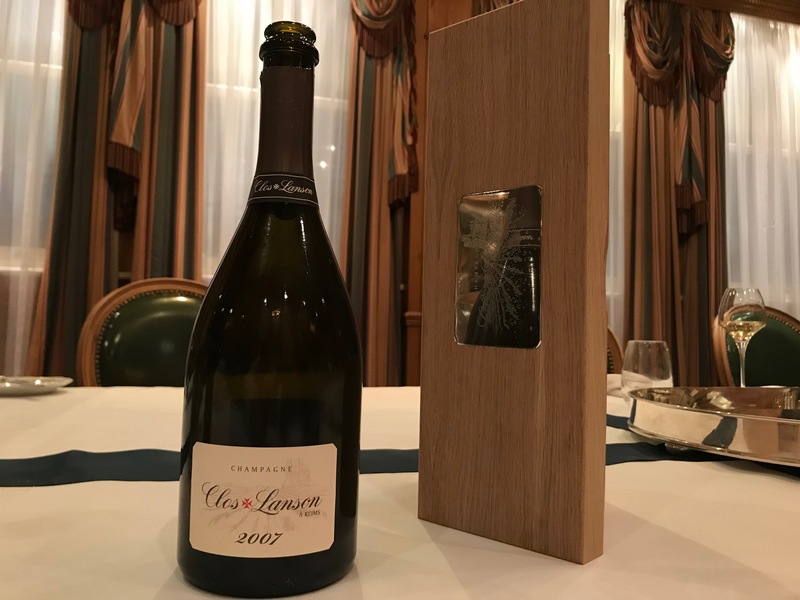 Although available on the market for some time, Champagne Lanson had yet to officially launch the latest iteration of their prestige cuvée: Lanson Noble Cuvée Brut 2002. 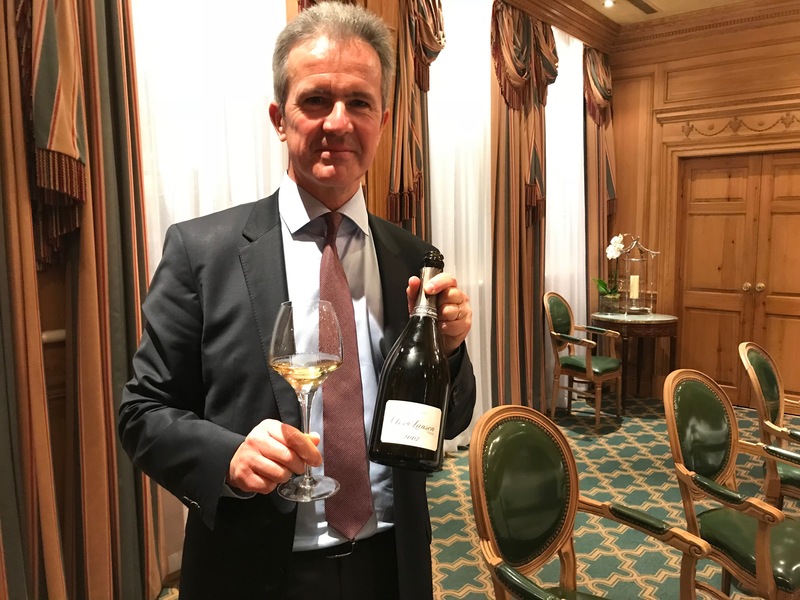 So to celebrate the occasion we had dinner with head winemaker, Hervé Dantan at the Milestone Hotel in Kensington, where he also showed us new organic champagne ‘Green Label’ and a preview of the exclusive Clos Lanson 2007 – due for release next year. First up was the new creation, organic ‘Green Label’ unveiled in February this year. The story began in 2010 when Lanson bought 13 hectares of biodynamically cultivated land in the Marne Valley village of Verneuil from Leclerc Briant – the largest single biodynamic estate at the time. Of this plot, Lanson used 8 hectares to create first an organic base wine, before deciding to produce an organic champagne with the high-quality 2012 harvest. Made in the classic Lanson style – so no malolactic fermentation and three years ageing on the lees (to offset the high level of malic acid) – current production is around 65-70,000 bottles annually. First revealed at the 2017 Wimbledon Championships, featuring an appropriately green Lanson Maltese Cross and packaged in a recyclable box, this is a well-considered addition to the extensive Lanson range. 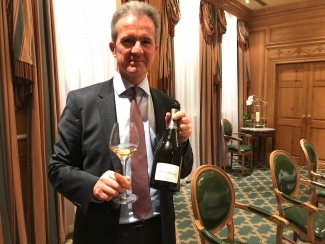 Although Paul Beavis, managing director of Lanson UK, has previously commented “we are not going the biodynamic route”, Hervé told us that he intends to produce Green Label every year and hinted that it may become a vintage-dated product in the future. Next we moved onto Noble Cuvée. Explaining its history, Hervé informed us that the first vintage was 1979 and the idea was to create a prestige cuvée to showcase the quality of Chardonnay, as the house was particularly Pinot Noir dominant at the time. Only produced in the best vintages, Lanson choose the best wines of the company (sourced from Grand Cru sites only) for the Noble Cuvée blend to express incredible finesse, freshness, saltiness and strong generosity. With incredible ageing potential, Hervé believes Noble Cuvée needs at least 12 years maturation to reach an ideal drinking window. 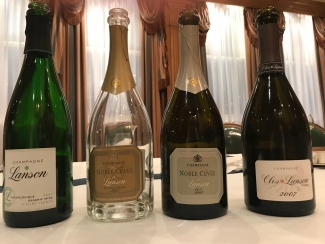 Noble Cuvée Blanc de Blancs was an extension on the wish to showcase Chardonnay and the first vintage was 1989. To finish, we sampled a rare preview of new champagne Clos Lanson 2007. 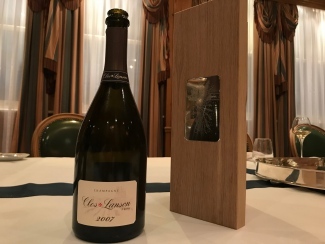 The first vintage, Clos Lanson 2006, received a warm reception across the trade upon release last year. Lanson’s first single-walled vintage, this pure-Chardonnay blend is incredibly rare and just 7,000 bottles are produced annually. The preview we tasted was an even bigger personality than 2006, displaying all the ripe and ready characteristics of a warm vintage. Read more about the Clos Lanson concept here. Lots of peachy character, aromatic and perfumed. Dosage doesn’t seem 6 g/l, this has quite a lot of richness making it not at all dry. Lovely balance and texture. This is tasting more forward than the last time tasted. Has loads of lovely richness, sea breeze aroma and lovely flavours of grapefruit and banana. Going back, it has some creaminess, caramel and cooked apple notes. Lots of warm bread aromas and toastyness coming off and much more red berry character and quite a lot of chalkiness and apricot and peach and on the palate seems to have way more body, seems drier and dried fruits character. Very different to the Blanc de Blancs and has more dried fruits, pastry and 30% Verzenay PN that has delicacy and freshness and salinity and seems more evolved. The warm year of 2007 comes through on the nose: rich, ripe and with a hint of honey. The highest level of acidty since 1996, this has a real freshness to it. Loads of ripe apples, some pineapple and guava notes. Seems slightly bigger then the 2006.